Courtesy of Luna Grey Interiors. Photography by Kelsey Ann Rose. blending of seemingly disparate design styles. That is the New Modernism. When you say "modern," it can mean a million different things to a million different people. A couple of well-known styles of modern design are mid-century modern, the movement that started it all, and contemporary, which is often thought to be stark, hard-edged and even industrial. But design is always evolving, and the new modernism is softer and more accessible than ever. Soft color palettes, rounded edges and personal touches are leading the newest wave of modern design in a more casual direction. Gone are the hard lines and hands-off futuristic vibes, and in their place a warmer, more comfortable modern. Here is some inspiration to help you snag the look for yourself. In this playroom, the homeowners have used floating shelves to display a curated collection of their kids’ favorite books and treasures. The new modernism relies on personal touches and greenery to create a loved, lived-in impression. Also on display is a wide variety of textures, from the sleek metal table to the fluffy area rug to the warm wood floors. The bright and earthy tones complement each other while the potted plant blends with the round table for a subtly organic feel. A slightly more straightforward modern look, this dining area retains a mid-century Scandinavian vibe in its furniture. But the chandelier’s restoration-style bulbs are a departure from the typical fixture you might expect here, and the contrast lends a relaxed, informal feel to the dedicated dining space. Emphasizing the soft, earthy green-gold color on the upholstery and rug further brings a grounding element to the otherwise bright white space. This snuggly living room just begs for an afternoon thunderstorm spent tucked up into that cozy sofa. Far from the forbidding, angular silhouettes some modern styles rely on for impact, this furniture is almost anti-impact in its welcoming softness. Visually, however, the impact remains modern and clean with the classic Womb Chair and the sleek, contemporary lines and matching soft colors of the complementary floor lamps. Mixing styles to create your own is half the fun of decorating, and this living room embodies that adventure perfectly. The contemporary concrete table is as clean as it gets, with geometry complemented by the hexagonal pendant above. The addition of a mid-century style sofa and armchairs add warmth and historical gravity. There’s even a little country charm courtesy of the portrait of a watchful longhorn. Yet nobody can deny the overall impression is totally modernist. Another example of mixing styles, this living area feels fresh and vibrant with a variety of design elements. 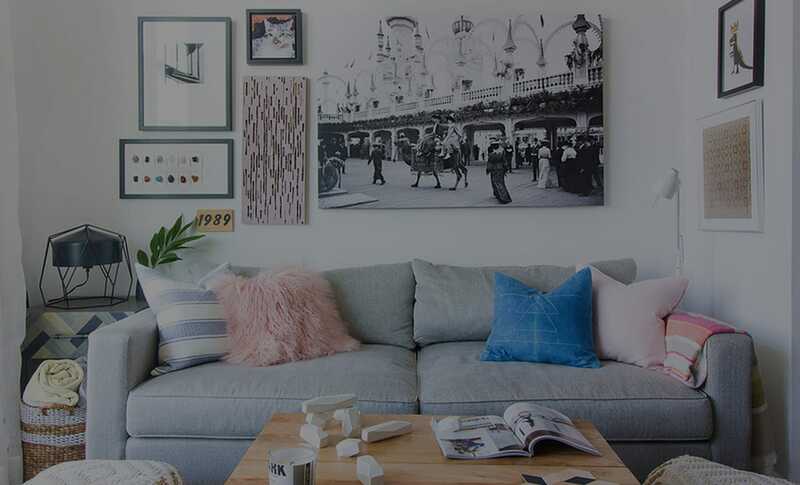 From the contemporary starburst pendant to the blue velvet Chesterfield sofa to the funky Persian rug, there is a variety of styles present that somehow work together to make a fun, cohesive look. The deep blue walls and creative upholstery options only add to the new modernist aesthetic. Grey is the new beige, copper is the new brass and round is the new straight. Rounded pendant lights and ultra-contemporary--but still curvy--seating add a definite touch of organic warmth and modernity to an otherwise traditional-feeling white and grey kitchen. Coppery tones are so totally in, especially paired with greys and natural greenery--if copper sounds too outdated, you can just call it rose gold. Finally, this living room brings the new modernism trend all together under one roof. In this eclectic space, the light palette and sumptuous blend of textures is unmistakably modern. You can see a blend of styles here, from the contemporary floor lamp to the more traditional club chairs and casual window treatments. Keeping the elements mostly light tonally and soft to the touch allows for a greater flexibility when mixing styles across different design eras. Stronger colors can then be used as accents without weighing down the room or dominating the style.